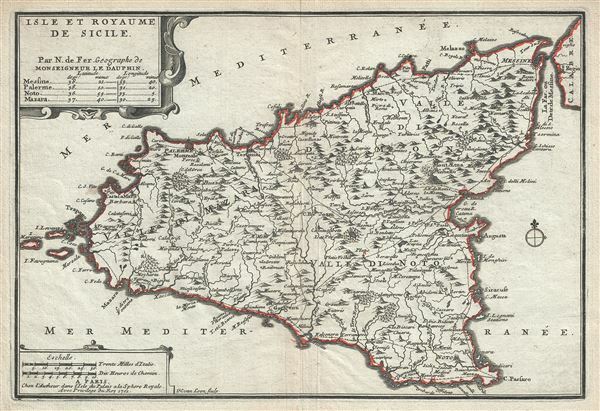 A beautiful 1701 map of Sicily, Italy by Nicholas De Fer. It covers the Mediterranean Island in its entirety and renders the region in extraordinary detail offering both topographical and political information with mountains beautifully rendered in profile. Mt. Etna, the tallest active volcano in the region, is beautifully rendered. Sicily became a Greek colony around 750 BC and according to Greek mythology, the monster Typhon, is trapped under Mount Etna. This map was engraved by Harmanus van Loon and created by Nicholas De Fer for his 1701 Atlas. Harmanus van Loon (fl. c. 1690 - c. 1725) was a Flemish engraver active in Paris during the late 17th and early 18th centuries. Van Loon worked primarily in Paris and often signed his work, which includes maps and other engravings for such prominent cartographers as Nicolas de Fer, Jean Baptiste Nolin, Guillaume Delisle, and others. There is some speculation that he may have been related to the Brussels born painter Theodorus van Loon. Very good. Minor wear along original fold lines. Original platemark visible.